Home / blogs / Happy Birthday to Me! Yes, it's amazing how time flies. Muscat Mutterings is one year old today!!! It all started with this blog post, quickly followed by this one on Piracy in Muscat. Over the weekend, in the Al Fair parking lot I was again asked that familiar question (no, I never want my car washed by you and your paint-scratching crew, ever): "You want DVD movies?" I took my inspiration from the now-legendary Undercover Dragon at Muscat Confidential, and am always grateful for his support of my blog (and the traffic he sends me!). 1. I've published 116 articles, this is the 117th. 2. I've had just over 30,000 visits in the last year, and nearly 50,000 page-views. 3. Of those 30,000 visitors, 20,000 have been visitors from Oman. 4. Muscat Confidential has sent me over 11,000 visitors. 5. I've had visitors from 109 different Countries, but strangely, none from China. 7. You lot so very rarely ever comment. 8. My most commented blog post ever was this one about the cost of ball tickets. 9. My most read (in terms of opened for comments) article is this one about the cost of living here. 10. I recently launched a Facebook group for this blog as I saw just how successful it has been for Muscat Confidential, and my statistics show that my largest readership demographic is women, between the ages of 25-34. Thank you to all of you for reading my blog, it keeps me motivated to keep it going. Congratulations on a fabbarooney blogging year Mister Mutterings. 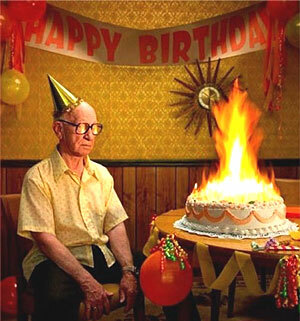 Happy, happy, HAPPY birthday... but do try and enjoy it a little, you look positively miserable in your picture! Happy Birthday! I need to blogroll you so I can stay updated. YOu aren't showing up on my reader!